Agapanthus orientalis Black Magic is a darker flowered version of this popular plant that creates a powerful presence in your garden due to its outstanding dark purple flowers that emerge from black-ish buds. Foliage is as per everday Agapanthus, e.g. straplike, deep green, glossy and densely clumped, making a good border display when not in flower. These are hardy plants that even fall into the category of 'indestructible' and can look after themselves even if you went on holiday for months. Soil: Well drained soils are best in a sunny location, though a little shade is well tolerated throughout the day. If soils are light then add some organic matter as they do need access to moisture when coming into flower. Maintenance: Little or none, apart from cutting back old flowerheads. They do, however, multiply quite vigorously from their fleshy roots so ensure they can't spread unchecked. You can thin them out every few years by digging them up in autumn/winter and dividing roots - this can be done quite ruthlessly without harming them. 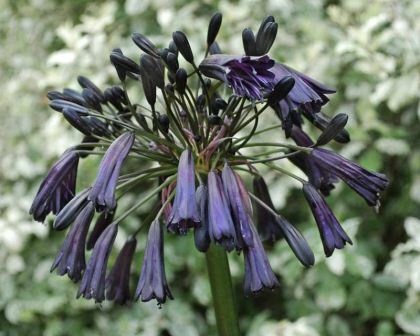 Other Species: Agapanthus africanus, Agapanthus campanulatus, Agapanthus inapertus, Agapanthus "Loch Hope" amongst others. Comments: Name (Agapanthus) means "Love Flower".